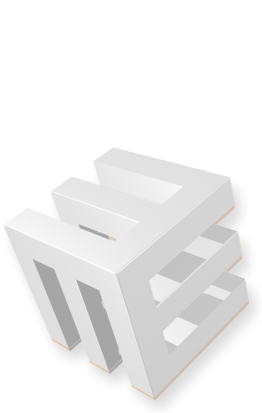 EZGenerator templates have one or more editable images in their design. These are also called banner images that are usually run along the top of the page. You can replace editable images with your own while in 'EDIT mode'. 1. Place your mouse cursor over the image and click the spanner icon that appears on the top-left corner of the image OR Right-click the image and select 'Editable images'. 2. Choose Select image on the drop-down menu window. The image will show in the Preview area. If you see the four-arrow cursor in the preview area, you can drag the image to reposition it. Editable Images (drop-down menu) - Lists all editable images, some templates supports more than one editable image. Mode (drop-down menu) - Mode for the editable image. Image Mode to insert single image. Slideshow, to insert few images as slideshow. With Custom Flash option you can insert your own flash animation. You can also add images as a Slideshow. 1. To create a slideshow, use Add New button to add one or more images to slideshow. 2. After adding new image, use the 'Select Image' button or select one of the presets to customize it. Then click Save Entry to save image changes. 3. Check Random Images Order to show images in random order. 4. 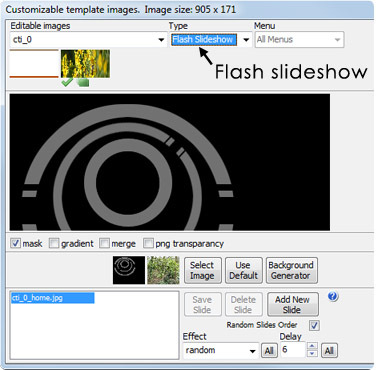 Use Effect menu to apply different effects to the flash slideshow. 5. Use Delay menu to change slideshow speed. If you select Custom Flash, use the Browse button to navigate to the flash file. As you browse various replacement images, you will notice a set of thumbnails at the bottom of the window - Recent Images or Presets. These are the images you have used recently for replacement. Click a thumbnail to automatically reselect the image. Use Use Default button if you want to restore the original image. Use OK button to apply the changes you have made. Menu Item (drop-down menu)- Sets link between editable image and menu item. If you want certain image to be displayed only for pages within specific menu item, select the menu item here. If you want certain image to be displayed for all menu items, select All menus option. Below you can see the list as thumbnails. The green checkmark shows the currently selected one. Mask (check box) - Enables the mask effect (some images contain a mask and you can insert the image only within the area defined by the mask). Gradient (check box) - Enables the gradient effect. Some image formats such as .GIF and .PNG allow gradients so the image can fade into the background. These gradients must be created in an image editor. Merge (check box) - Check this box if you want to merge more than one image when working with certain editable images. Select the images one by one, using Select Image button THEN use the four-arrow cursor in the preview area to position each image properly. PNG transparancy (check box) - Sets transparancy. Available only if you insert PNG format image with transparent layers used in the image. Use the Background Generator option if you want to design your own image. For more information, see Background Generator .